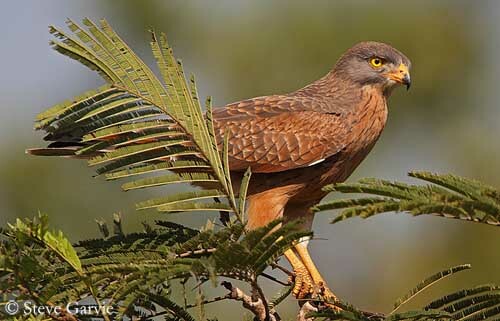 Grasshopper Buzzard is a small bird of prey with slim body and long wings. 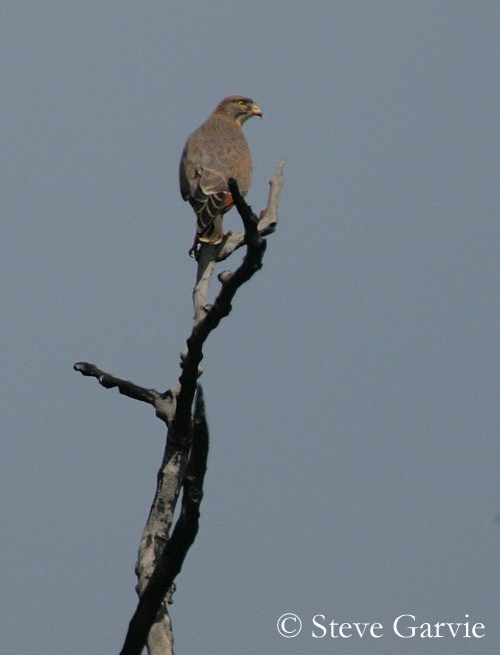 Adult male has grey-brown upperparts. Mantle and wing coverts show finely edged rufous feathers. Primaries flight feathers and their coverts are bright rufous with black tips. Trailing edge is white. Tail is grey with narrow incomplete dark bars, and blackish subterminal band. Tip is whitish. On the underparts, throat is whitish, with black stripe in the centre, up to the chin. Breast is buffy, streaked with dark brown. Vent and undertail coverts are white. On the underwings, coverts are white, but they can be spotted with dark grey. Primaries are white to buffy-white with greyish tips. Flight feathers show subterminal dark grey band, and trailing edge is white. Undertail feathers are grey, with blackish bars. On the head, plumage is dark grey-brown, slightly streaked blackish. We can see dark brown malar stripes. Hooked bill is yellow, with yellow cere and black tip. Eyes are yellow. Legs and feet are yellow. Grasshopper Buzzard feeds mainly on insects, and particularly grasshoppers. It can also take small birds, rodents and reptiles. This raptor hunts from a low perch. Large insects are its main preys, and it catches them on the ground, or sometimes on the wing after short aerial pursuit. Grasshopper Buzzard is migratory. It breeds in the northern parts of its range where it remains during rainfalls. It moves southwards in September. In the western parts of the range, migration is more indistinct. It avoids the equatorial short rain season, and prefers to frequent arid thorny bushy areas. Grasshopper Buzzard is relatively gregarious, often seen in groups of 50 to 100 birds, mainly in recently burnt areas where there are insect emergences. 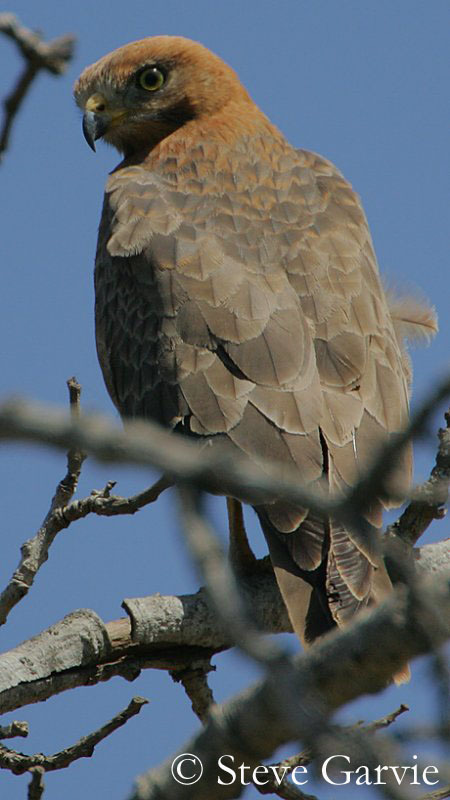 Grasshopper Buzzard is a common intra-Africa south of the Sahara migrant. 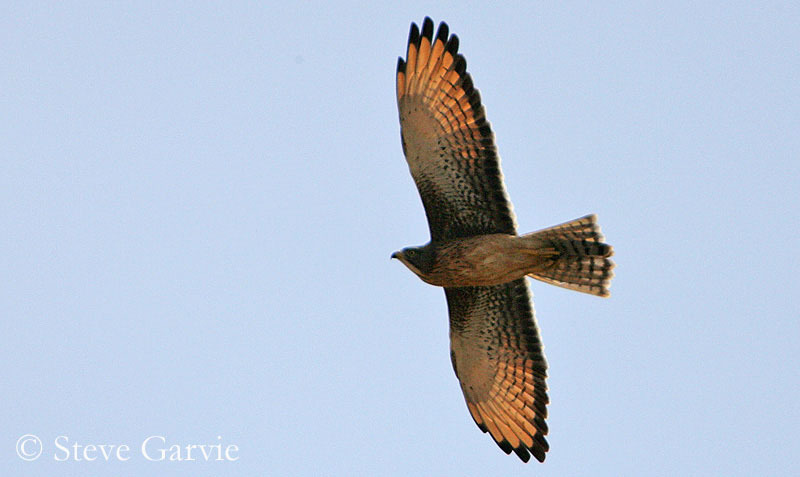 Grasshopper Buzzard flies mostly low from the ground, with buoyant flight, performing long glides and upwards swoops. This species can fly high, up to 300 metres. When in flight, it resembles Kestrel, Kite or Harrier. Breeding season occurs between March and May in the northern part of the range, but laying depends on the region. Nest is placed in a fork of tree, in low tree, or sometimes at about 10 metres above the ground in taller trees. Nest is made with sticks, with a cup in the centre, lined with green leaves. Female lays 1 to 3 bluish-white eggs, with some dark markings. Incubation and nesting behaviour are unknown at this moment. Fresh green leaves are added throughout the nesting period. Grasshopper Buzzard feeds mainly on large insects, particularly grasshoppers. But it also catches mantis, termites, ants, beetles and spiders. It can take small birds, rodents and reptiles. Grasshopper Buzzard is widespread in its range. It is common intra-subsaharan Africa migrant, locally abundant in several western areas during the dry season. It is a nomadic species, and takes advantage of local food resource offers. 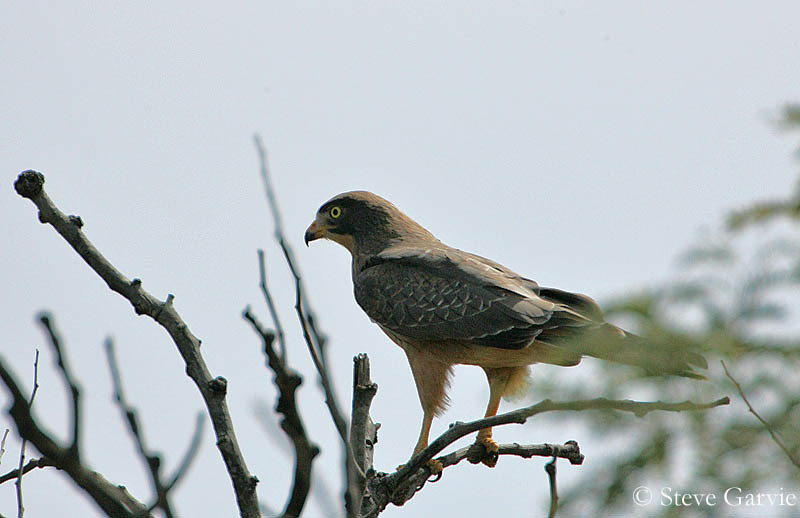 Juvenile has grey-brown upperparts with more important scaled effect than in adults, with broad rufous edges. Tail is grey, only with subterminal dark band. On the head, plumage is paler, streaked with dark brown. Ear coverts are pale grey. Eyes are darker yellow with dark eye stripe. Grasshopper Buzzard utters loud “ti-ki-ki-ki-ki-kee” repeated several times. This species is usually silent, but it can become very noisy during breeding season. Grasshopper Buzzard usually frequents woodland and forest edges, and arid thorny savannahs. It also can be found in marshes’ edges and over burnt areas. Grasshopper Buzzard is found in tropical sub-Saharan Africa, from Senegal to Somalia and Eritrea. This species migrates to southern Tanzania after breeding season.